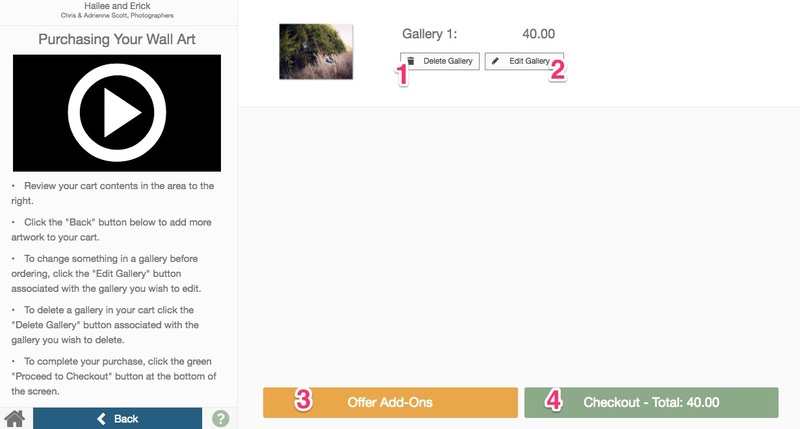 To add a gallery to the cart, simply click on the Add to Cart button while that gallery is the active gallery in the Designer. This will keep you in the Designer. When you have at least one gallery added to the cart, you will see Skip Wall Art changes to Review Cart. To sell products that are not wall art, just click on the "Offer Add-Ons" button in the Review Cart screen. 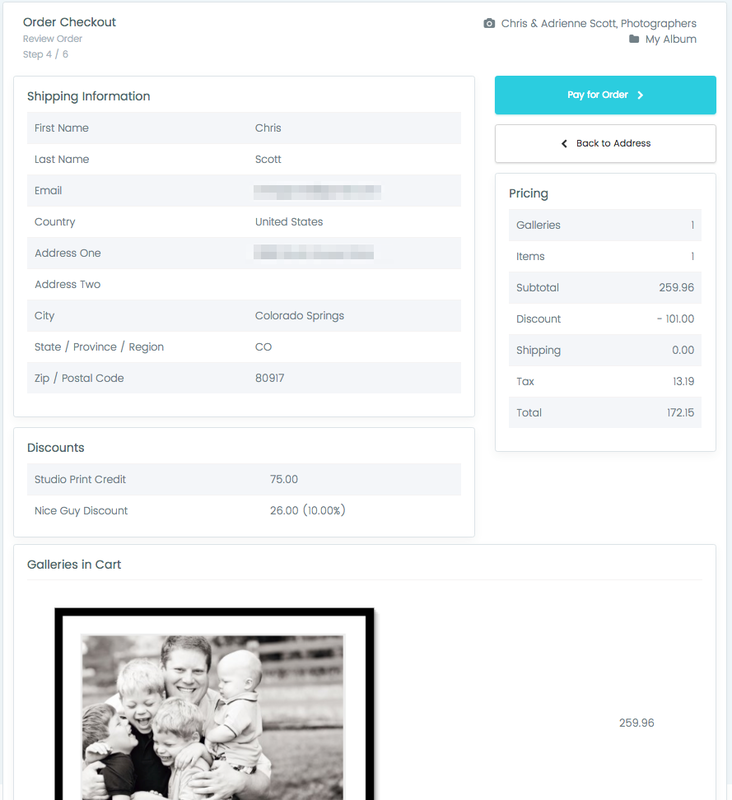 Enter a description of the Add-On (ex: 8x10 metal print), the price for that Add-On (single item price), how many of that Add-On your client is ordering, and any notes you wish to add to the order. 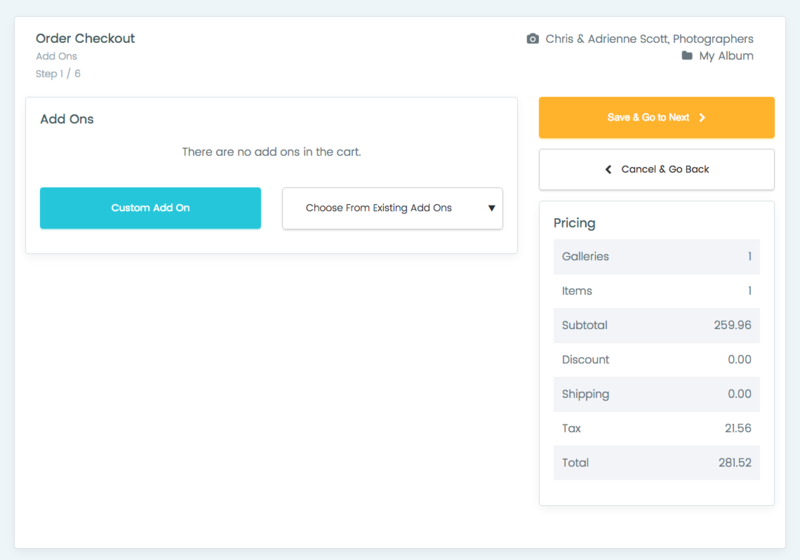 The Add-On will automatically be added to the cart and the pricing on the right hand side of the screen will update automatically. Repeat the above steps for any additional new/unsaved Add-On products. If you need to get an image number, just click on the "Show Images" button at the bottom right of the screen to slide up a filmstrip of all images, including image numbers. 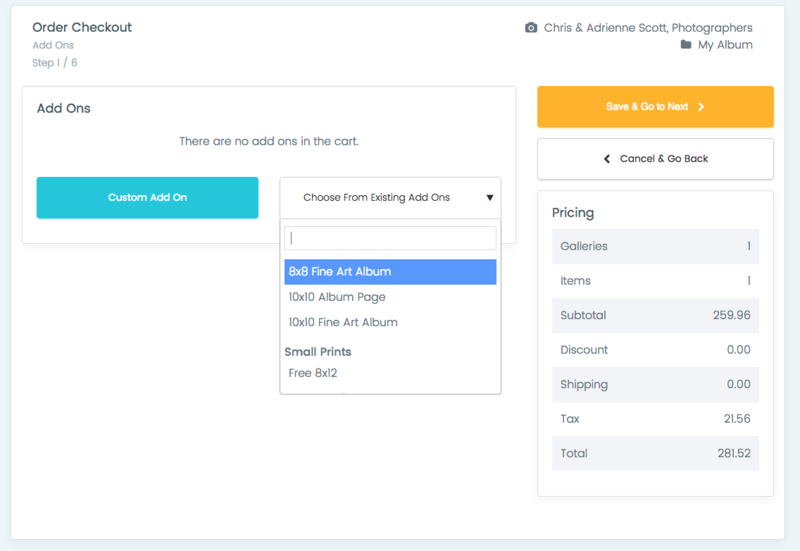 To add an already saved Add-On to the cart, use the dropdown menu to select the Add-On. Previously saved information will automatically be used but you can modify this information here if you wish. This is helpful if you want to include file names/image numbers for this product. For example, Notes: (previously saved) Five 8x8 Mounted Prints on a Metal Easel. (New note addition) Image numbers 0011, 0025, 0032, 0033, 0038. You can include as many previously saved or new add-ons to the cart. The prices on the right side will all update automatically as you go. Depending on your settings for this meeting, when you click "Save & Go to Next", you may or may not be taken to the Discounts screen (you can toggle this on and off in the settings for this meeting). Enter a description and amount for the discount. 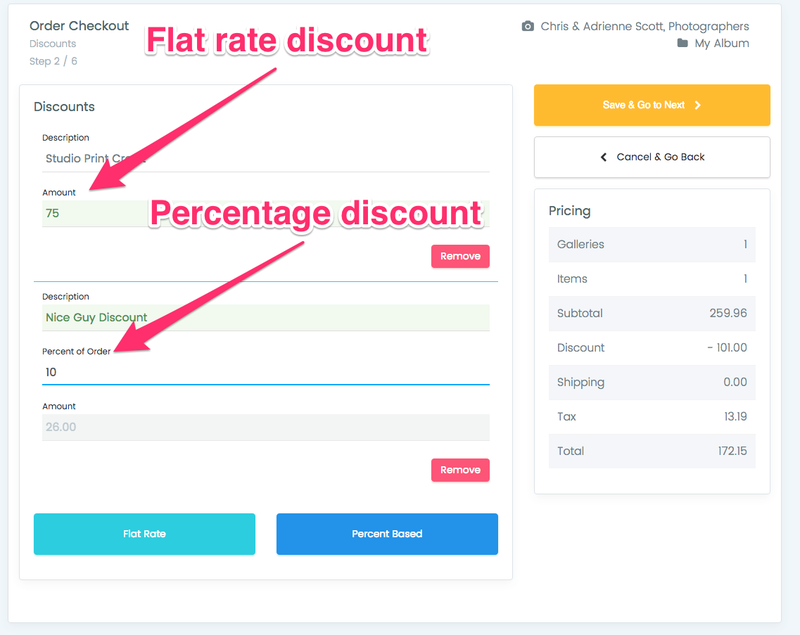 Percentage-based discounts will show the amount that will be discounted for you. The discount will be applied to the order subtotal automatically. Enter the client's shipping info (we will not place orders or ship orders, this is for your internal use as well as our sales tax calculation). Enter the client's credit card number (if you are in the United States and if Payment Processing is turned on in your Preferences. If Payment Processing is off, you'll proceed directly to placing the order. You'll want to collect payment in whatever way you're already using). Checkout Complete. 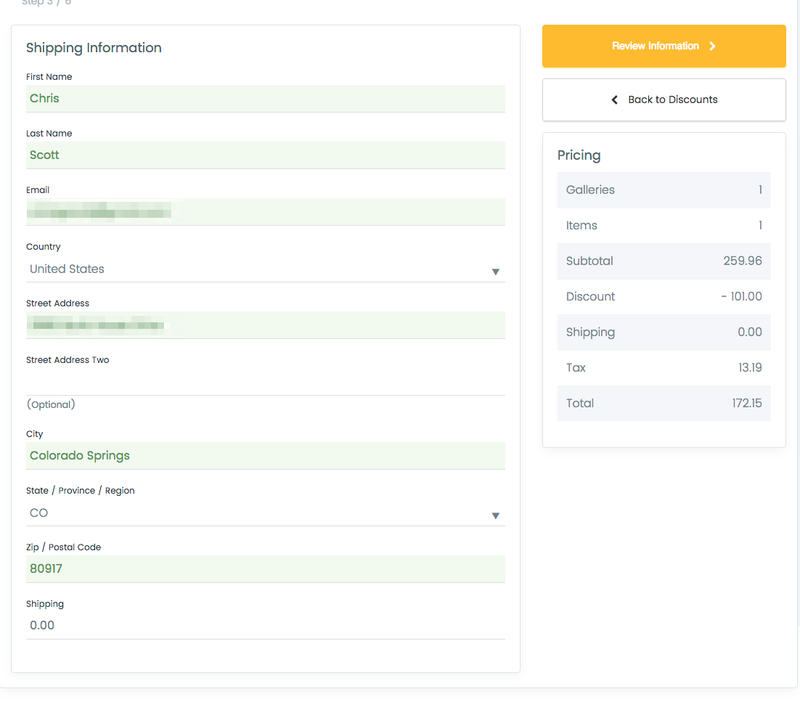 You will see the order details again (the same details from the Review Information step) and it will also show you in a green box that an email has been sent to your client's email address that you entered during the checkout process in the Address Information step. After the order has gone through, you'll see this order in your Recent Orders on your main dashboard (when you log on at http://app.swiftgalleries.com) or when you go to Swift Galleries > Reports > Order Report > View Order. If you want to give your client a receipt for the road, you can also do that.